It’s hard to believe this day is finally here: Teresa and I are in Baton Rouge this morning picking up Lazaruff to drive him to northern Idaho in search of a forever home. Lazaruff was supposed to become our dog — but I’m getting ahead of the story. First, Laz was supposed to be dead. That’s what the workers who found him in an abandoned house thought. That he had died of thirst and starvation. When animal control came to pick up the body and found out he was still alive, they rushed him to the vet. Once there, they gave his emaciated little body — he weighed 19 pounds — fluids, and discussed his poor outlook for survival. Reluctantly they decided euthanasia was the best course… until they realized he was wagging his tail. Teresa and I met Lazaruff after he was a robust 27 pounds (he now weighs 66, to give you an idea of how bad it was) while we were volunteering at a clinic for homeless pets and the pets of low income people in St. Landry Parish, Louisiana. Although we’d vowed not to adopt that day, we took one look at this tail-wagging skeleton covered in skin and broke that vow so fast it caused a sonic boom. They’d called him “Relic,” but in recognition that he’d come back from the dead we named him Lazaruff. We planned to bring him into our family, but he had a long road ahead of him first. He had heartworm, but he needed to get up to a better weight and in better condition before beginning treatment. 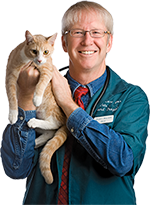 He started his journey to health with Dr. Kevin Fuselier at Bellevue Animal Clinic in Opelousas. Dr. Kevin works regularly with the shelter that was trying to save Lazaruff from the first day, St. Landry Parish Animal Control, which is under the direction of an incredible angel of mercy, Stacey Alleman. While with Dr. Kevin, Laz was taken under the wing of his son, Jake, who trained Laz and shared his love and time with him. Dr. Krista Sirois and Dr. Lisa Radosta from Florida Veterinary Behavior Service consulted long distance to make sure Lazaruff’s emotional needs were being taken care of along with his physical recovery. Eventually we moved Laz to Baton Rouge Animal Hospital to be under the care of a Fear Free Certified trainer, and Jake and the team at Bellevue Animal Clinic threw him a beautiful going away party. As Laz continued his amazing recovery, his team realized that he was probably not going to be happy with our family for a number of reasons. Still, we hadn’t come this far to turn back now, so we reached out to our good friend Mandy Evans at Panhandle Animal Shelter in Idaho, where we adopted out little dog QT Pi Becker. She set up a quiet foster home for him to stay while we work to find him the perfect home. 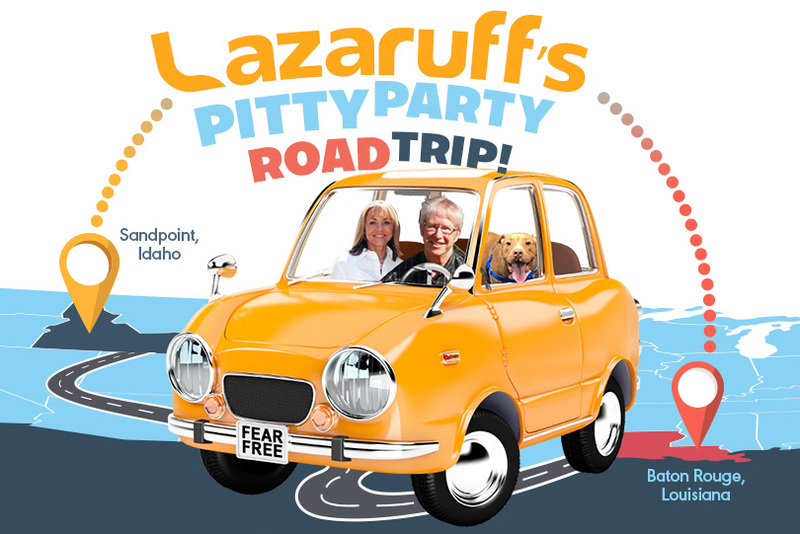 We wanted to fly Lazaruff to Idaho, but we found that no commercial airline would fly a dog they considered a pit bull. As a longtime pit bull family and a veterinarian who knows all dogs are individuals and opposes breed discrimination, it was a sobering reminder of what these dogs face. A friend of ours, Marilyn Iturri, generously offered to fly to Baton Rouge and drive Laz to us in Idaho, but Teresa and made the decision to drive him ourselves. Today we’ll be picking him up and heading north and west to his new life. His veterinary and behavior team have him ready to go, and his friends at Petmate and Kong showered him with even more gifts, which we hope to share with other homeless pets since there’s not a chance in the world Lazaruff would ever be able to use them all! Back in Idaho, our neighbor Nate and his little girl, Maddie, are caring for our home and animals while we’re on this road trip. On the road, Marriott arranged dog-friendly accommodations for us. Only the best for Lazaruff! One thing we wanted to do but won’t be able to is visit Fear Free headquarters in Denver. That city has a pit bull ban that applies even to dogs just passing through. I’ll have more to say on that later, but for now, let’s focus on the positive! Our commitment to you goes beyond the veterinary and training bills we’ve paid. It goes beyond the miles we’ll put on this rented car. From now on, people will mean help, not hurt. Lazaruff, you are going to have care for your physical and emotional wellbeing. You are going to have baths, sleep on super comfy soft beds, be walked, be trained, get toys and treats. You are going to have a life as happy, healthy, and full as we can make it.